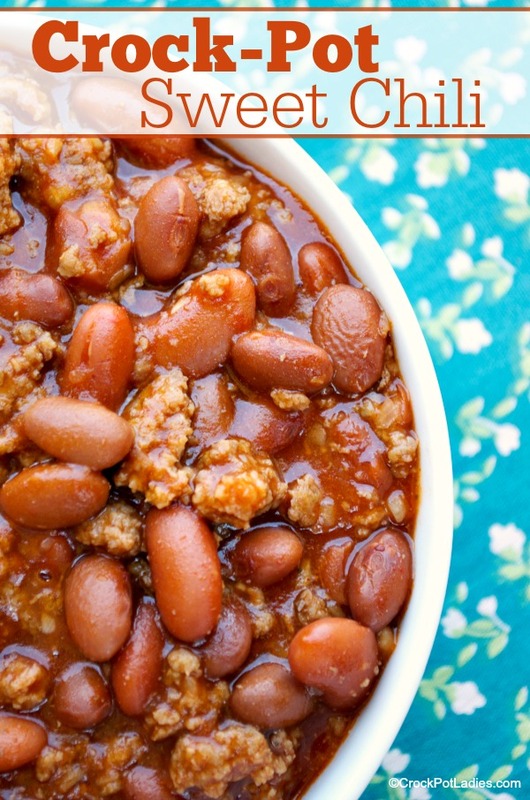 The whole family will love this easy recipe for the best Crock-Pot Sweet Chili out there! 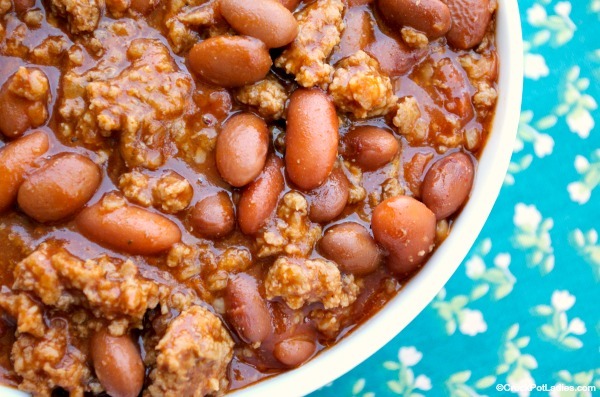 Beans, ground beef, and a touch of brown sugar makes this simple non-spicy chili perfect for everyone including the kids. Top your bowl of chili with shredded cheese, onions, sour cream or whatever you like. A side of cornbread makes it the perfect meal! We decided to enter a chili cook-off at our local community center just for fun. 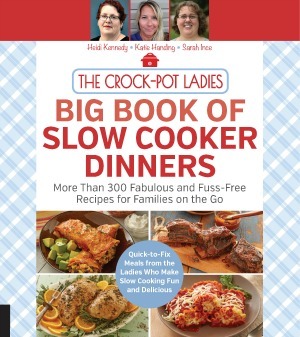 While we were not expecting to win a prize we thought it would be fun just to enter a slow cooker full of yummy chili and chat with folks in our community and then go around the tables at the cook-off and sample some of the different kinds of chili. It was totally a fun time for everyone in my family! 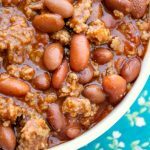 When it came to deciding what kid of chili we wanted to bring there was some heavy discussion among my kids and husband on if we wanted to make a super spicy chili…the kind that knocks your socks off and makes you sweat. Or if we should do a mild chili that was friendly for everyone in attendance at the cook-off…even small children. We decided on the later and everyone was happy. I then remembered this easy chili recipe that my mom makes all the time for a sweet chili. I remember it being hearty with plenty of ground beef, just the right amount of beans, not spicy…at all and there was just a little bit of sweetness to it. I just knew it was the recipe for our family to bring! So I got to cooking up some hamburger and threw everything in the slow cooker for a couple of hours and brought it to the chili cook-off. And it was a huge hit with the crowd. Everyone came up for a sample and we got so many comments on the great flavor and the respite from the mouth burning, tongue tingling hot and spicy chili everyone else at the event was serving. It was really nice to be able to hand out little sample cups to children of all ages so they could enjoy the cook-off too. Of course if you want to add some spice and heat to this sweet chili recipe you can. Just add some cayenne pepper, red chili flakes, diced jalapeño pepper or whatever you like to make it as spicy as you can handle! This is a sweet chili, specifically made to not be spicy and be sweet. We served it at a local chili bake off and I think the taste testers were quite happy that they had at least one chili that wasn’t making their tongue burn. In a large skillet on the stove top brown the ground beef and drain off any excess cooking fat from the meat. Add the cooked ground beef and the remaining ingredients in a 6 quart slow cooker and stir to combine. Cover and cook for 6 hours on LOW or 3 hour on HIGH. Serve chili in bowls topped with your favorite chili toppings such as shredded cheddar or jack cheese, diced onion, sour cream, etc. We’ve had a question about the size of cans. The Chili Bean and Kidney Bean size will be about 15-16 oz. The Tomato Sauce Size will be about 8 oz. I am confused. The recipe says 28oz. for the beans and tomato sauce 14 oz. Which directions should I follow? I love your website recipes. You are needing 28 ounces of kidney beans (which typically is 2 cans that make 28 ounces) and 28 ounces of Chili Beans (again 2 cans) and 14 ounces of tomato sauce (which could be one or two cans depending on your size of tomato sauce). hope that clears any confusion up. 1 T of chili powder so that there is the hint of heat without overwhelming. Sounds great Gary! I think all of that sounds great! So delicious and super easy to make – my favorite kind of recipe! I made this chili two nights ago and it turned out perfect, especially with it being my first time making homemade chili without cutting any corners. I added Rotel (medium) to give it a little more spice and tomato taste. I used two cans of pinto beans and drained both. Shockingly, the chili still turned out meaty with just two cans of pinto beans. So glad you enjoyed the recipe Ashli! I love this chili recipe. I sometimes switch it up with 1lb sausage and 1lb hamburger. Also amazing in the smoker. Sounds great Nathan! I would love to learn more about how you cook it in the smoker! Could you please tell me what your serving size is? I’m on a strict diet and need to be able to account for what I’m eating! Thanks! Unfortunately Jane, we do not measure out portion sizes in our recipes. A serving of this chili is 1/10th of the recipe.